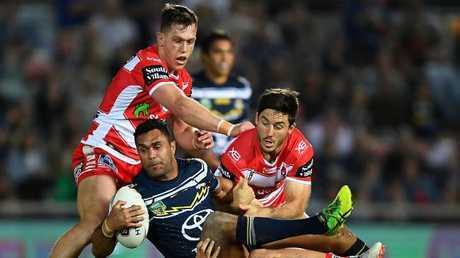 NORTH Queensland's season from hell has hit a new low after the Cowboys equalled a decade-old record with a 24-10 loss to the resurgent Dragons in Townsville in Saturday night. Johnathan Thurston's farewell tour has turned into a horror show with the Cowboys facing a six-week fight to avoid the wooden spoon. After seven straight years of finals appearances, the 15th-placed Cowboys have seemingly forgotten how to win after slumping to a fifth straight loss at 1300SMILES Stadium for the first time since 2008. 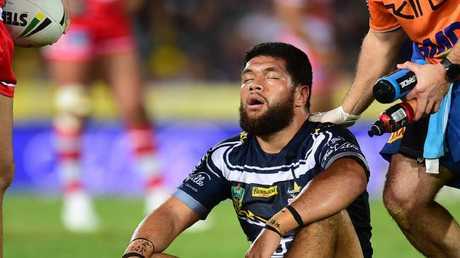 Ironically, it was the sharpest the Cowboys have looked all season, but a glut of errors and bizarre decisions relegated North Queensland to its eighth loss in nine games. "I'm a little bit disappointed personally with my performance," Thurston said. "I wasn't up to standard defensively and really put us under the pump with simple one-on-one misses. "Our effort was great, even though we lacked concentration in some areas. "We really busted ourselves. That's all I ask of our playing group over the last six weeks." The Cowboys have now lost five home games in a row. AAP Image/Michael Chambers. Having decided to blood some new talent in recent weeks, coach Paul Green handed Thurston's potential successor, Jake Clifford, his NRL debut at five-eighth. But an injection of youth was not enough to spark the Cowboys as their decision to kick penalty goals when trailing backfired against the determined Dragons. With big guns Matt Scott (neck), Jordan McLean (foot) and Michael Morgan (biceps) sidelined, the Cowboys were missing some of their heavy artillery. 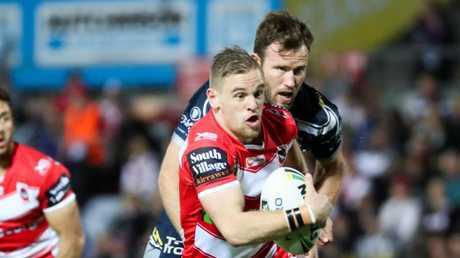 But 13 errors let the Dragons off the hook in key moments as the Cowboys bumbled their way to their fifth straight loss for the second time this year and 14th defeat in 18 games this season. Could North Queensland finish with the wooden spoon? Photo by Ian Hitchcock/Getty Images. "We shot ourselves in the foot at times," Green said. "We worked our way back into the game and were probably on top but came up with a simple error and released the pressure valve. "It's about getting the balance right between getting some young guys experience and making sure we're competitive. "We want to win every week." Dragons jet Matt Dufty exposed Johnathan Thurston in just the third minute to put veteran winger Jason Nightingale before the Cowboys started their weird ways. Thurston took a penalty goal when trailing 6-nil, missed another which led to Dragons lock Jack de Belin being sin-binned and kicked a second goal to make it 6-4. The tactics seemed to pay off when Cowboys forward Gavin Cooper scored against the 12-men Dragons but the visitors landed a double blow on the verge of half-time through Dufty and Tariq Sims to lead 18-10 at the break. The Cowboys were well in the contest, but poor ball control and some fortune for the Dragons saw debutant winger Jordan Pereira cross on debut for an unassailable 24-10 lead. 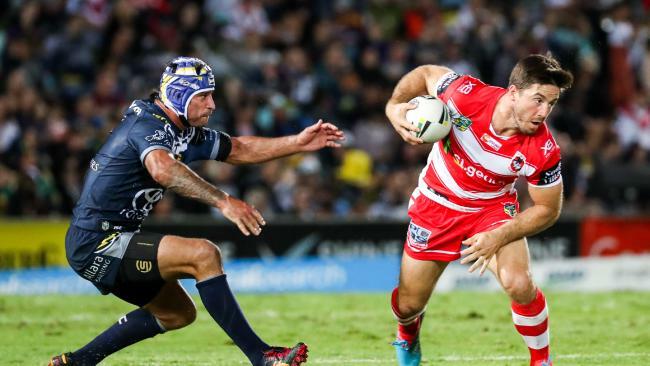 The Cowboys have a chance to snap their losing streak against Newcastle in Townsville on Friday night before a tough run of tough games against premiership heavyweights Sydney, Brisbane and Cronulla. They will not play finals football this season and are only sitting above last-placed Parramatta on points difference.